On Sunday, Aug. 12, Troop 50 bestowed the Boy Scouts of America’s highest rank during a ceremony honoring new Eagle Scout Nicholas Emil “Nick” van Zuk. He is the son of Rose-Marie Zuk and the late Dr. Gary Zuk of Auburn. 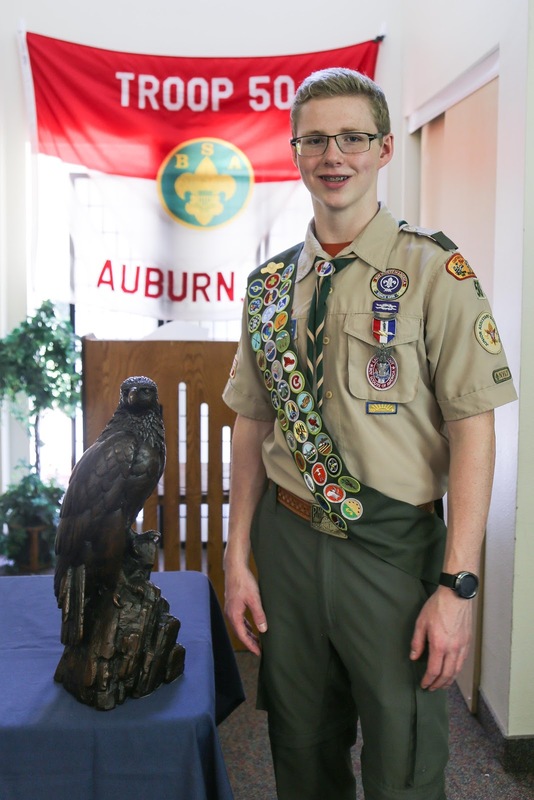 At the time of his Eagle Scout Board of Review, Nick was the troop’s youngest Eagle Scout and its 15th since its founding in 2012. Nick’s ceremony, held at Monarch Estates senior living and retirement community — the site of his Eagle Scout Leadership Service Project — included many of his fellow Scouts and adult leaders who have been in Scouting with him since his days as a Cub Scout, and who have served with him in a variety of troop leadership positions. It also included his pastor, Rev. Msgr. William Skoneki of St. Michael’s Catholic Church, who offered the invocation. 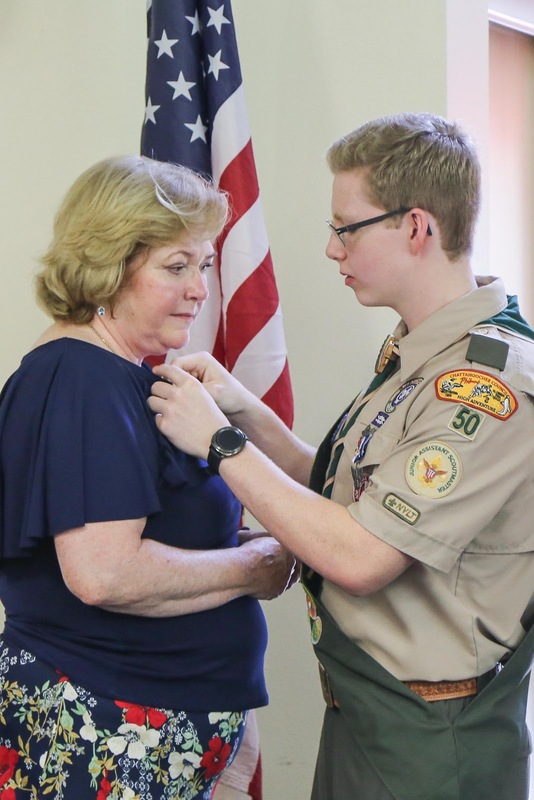 After accepting the “Eagle Scout Charge” from Scoutmaster Andrew Baird, Nick’s mother, Rose, the Eagle Scout medal on Nick and presented him with an Eagle Scout neckerchief slide. He in turn presented his mother with an Eagle Scout mother’s pin. Mr. Baird presented Nick with a framed Eagle Scout medal, noting that Nick was the first Eagle Scout in the troop to have enough merit badges at the time of his Eagle Scout Board of Review to receive all three Eagle Scout palms. 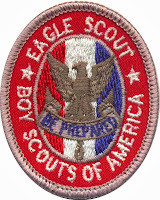 Concluding the troop’s recognition was Chartered Organization Representative Michael Tullier, who acknowledged the troop’s gift of membership in the National Eagle Scout Association. 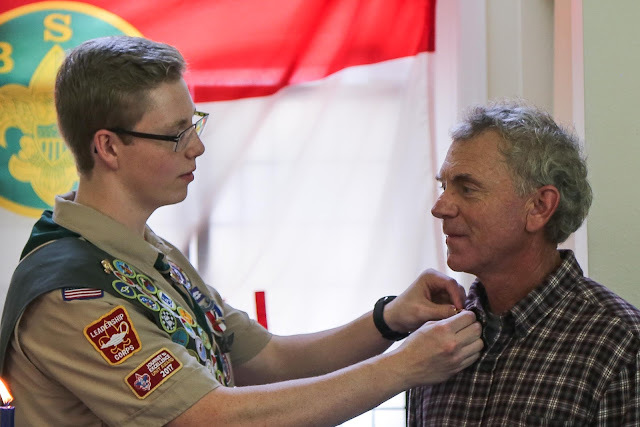 Nick honors the contributions of Mark Hankess, one of five individuals he presented with Eagle Scout mentor pins. 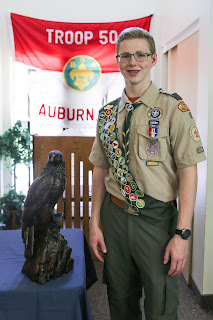 After earning Cub Scouting’s Arrow of Light as a Webelos Scout in Auburn's Pack 29, Nick joined Troop 11 before later transferring to Troop 50 in 2015. Since then, he has served as patrol leader, assistant senior patrol leader, senior patrol leader, lead instructor, and currently junior assistant scoutmaster. 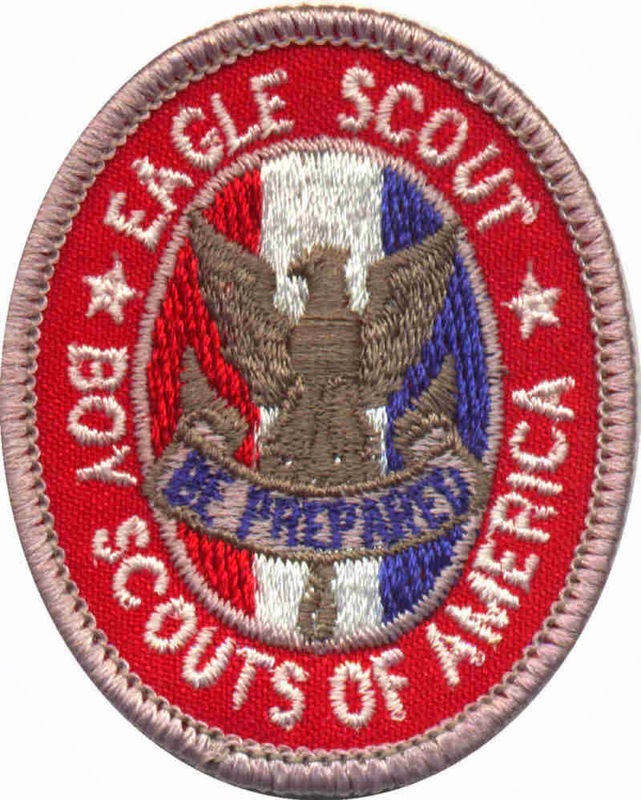 Through his Scouting participation, he had earned 39 merit badges by the time of his ceremony, qualifying him for a bronze, gold, and silver Eagle Palm. He also has accrued more than 75 nights of camping, 100 hours of community service, 100 hiking and backpacking miles, and 20 paddling miles. Nick received the troop’s 2017 James J. Baird Jr. Honor Scout Award; was inducted into the Order of the Arrow, Scouting’s national honor society; served as a youth counselor at Camp Half Moon at Camp Frank G. Lumpkin; and earned the BSA Mile Swim Award. 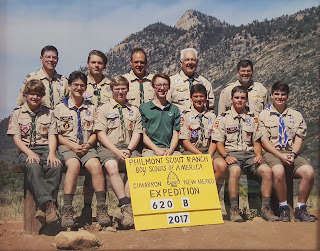 He completed National Youth Leadership Training, an intensive, six-day leadership development program, which provides Scouts with leadership skills and experience applicable to both Scouting and other situations demanding leadership. In addition to various troop-related outings and campouts, in June 2017, Nick participated in a 12-day backpacking expedition at Philmont Scout Ranch, the Boy Scouts’ largest national high-adventure base located in Cimarron, New Mexico. He also has participated in a seven-day sailing expedition at the Boy Scouts’ Florida National High Adventure Sea Base in the Florida Keys. 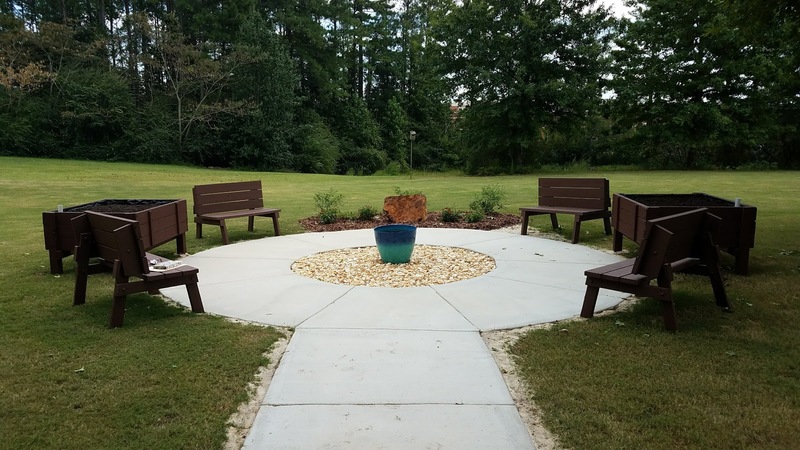 For his Eagle Scout leadership service project, Nick designed and raised funds for a Veterans Memorial Garden at Monarch Estates retirement community in Auburn. Family, friends, and fellow Scouts and leaders logged more than 520 service hours planning and constructing the project. The garden provides residents with an accessible concrete pathway; four benches that convert to tables, which allow residents and visitors more places to socialize; two self-watering raised planters; a butterfly garden; and a fountain. Nick's completed Eagle Scout Leadership Service Project at Monarch Estates. 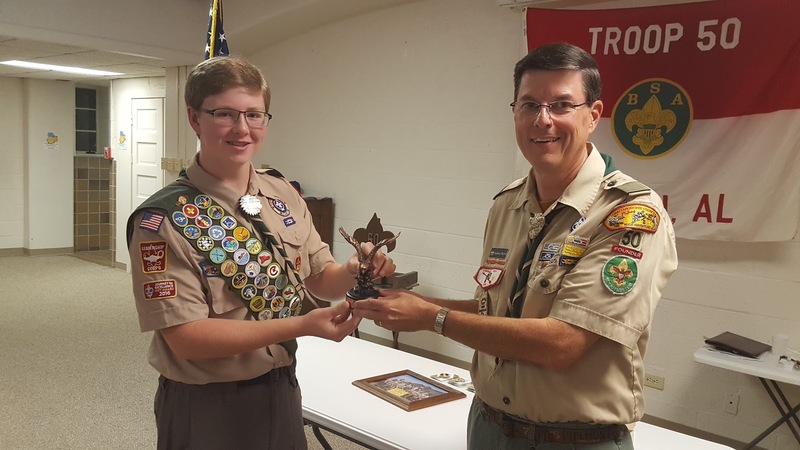 After completing the Eagle Scout rank requirements, which included planning and executing his service project, Nick appeared before the Saugahatchee District’s Eagle Scout Board on Sept. 19, 2017. He is among the four Troop 50 Scouts to earn the Eagle Scout rank during 2017. Currently, Nick is a ninth grader at Auburn Junior High School and is a member of the Auburn High School swim team. He and his family attend St. Michael the Archangel Catholic Church in Auburn, where he is an altar server. For more photos of Nick's ceremony and service project, visit the troop's online photo album.